Over the past few years, 24 states and more than 150 cities and counties have made it illegal to ask about a candidate’s criminal history on a job application — a trend often referred to as “ban the box” legislation. In our special post-webinar Q&A session, Jaime Lizotte, HR Solutions Manager, and Shanna Wall, Compliance Attorney, answer the top questions from webinar attendees. 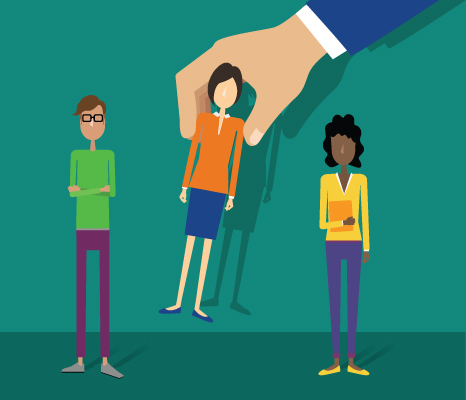 How long do I need to hold on to job applications for people I don’t hire? Well, that’s a great question because obviously you have all of their information on the job application and if they’re not going to be working for your company so it makes sense to think that you’re not going to have to keep that information, right? Unfortunately, with the job applications for candidates that you do receive but you don’t hire, you need to hold on to that information for at least 1 year. That also goes along with their resumes, drug screening tests, employment tests, reference tests and obviously all background or credit checks. So the answer to that question is to keep their information on record and in your files to be safe for at least 1 year. If someone submits a resume do I need to have them fill out a job application? Can I just ask them to submit a resume and a cover letter? As a best practice, yes, you should have them fill out a job application because job applications capture a lot of valuable information that resumes don’t usually cover. They’re going to cover things like the supervisors name, references, and phone numbers. Not everyone will include that information on their resume. You can also ask questions like reasons why someone left their company because on a resume no one is going to put that, or even on a cover letter. Job applications also include important legal disclaimers that protect you as you’re going through the hiring process with employees. We did speak about that during the webinar yesterday, as well about legal standards on your job applications. Is it now legal to ask for past salary information on job applications? It’s very specific to your state and local laws whether you can or cannot ask for past salary history. And again, more and more states are actually considering having this question removed as well but right now Massachusetts along with a couple other states, like New York and Texas, and cities Philadelphia and New Orleans, have already passed this law. A lot of them haven’t gone into effect yet. However, the Massachusetts does not go into effect until 2018, so you want to check your laws, but if this law doesn’t apply to your state or city, you can still ask that question on your job apps. Is it a good idea to take notes during interviews, or should I wait until after? Obviously you’re not going to remember everything that went on during an interview, especially when you’re interviewing multiple candidates for a position. Taking notes is perfectly fine during interviews. You should tell the candidate at the beginning of the interview that you will be taking a few notes so this will put the applicant at ease. It’s always best to keep your notes separate from the job application. You really never want to write notes in the margins of the job application or even on their resume. These are official employment records. You can keep notes separate. You don’t have to keep them in the file and you can discard them later. You want to be careful about the notes that you’re keeping per say. You may write something down that is going to help you remember certain candidates during an interview, but depending on what you wrote down about that candidate like, “applicant wore bright green goofy glasses,” or something that just stood out to you could be termed as something discriminatory if its kept in records later on and found so you want to be very careful about the notes that you’re keeping and make sure that you do not keep them on the job application or the resume that way you can discard them later. Remember, you don’t have to keep them directly with the file. I heard you can’t ask for a Social Security number on an application, is that true? You can, but as we mentioned in the best practices piece, it’s not recommended due to security reasons. It’s just not necessary for what you’re trying to establish. What you’re looking for from a job application is to see what that person’s qualifications are and the social security number doesn’t have anything to do with that. Actually, in most states, you can ask for the social but as Shanna mentioned it’s best to not ask for the number until you really need it for some reason meaning you actually hired the person or you’re going to do a background check but that’s definitely a great question. Can you expand a little more upon some of these enactments besides prohibiting the salary history question that other states and/or cities have? Sure, I know we talked about it just briefly in the webinar. Even though states might not have a state-spicific law where they prohibit the salary history questions, but there are plenty of states that have other kinds of pay equity laws and like we said it’s not necessarily just called Pay Equity, it could be called Fair Pay or Equal Pay, it’s however they want to name their laws. In most states there’s some form of equal pay protection as a bare minimum. Almost every state makes it unlawful for employers to discriminate in wages based on the sexes and again, they’ll forget that there is a federal law under the FLSA: equal pay for equal work. So those bare minimum state laws kind of reflect that and if they don’t, there are a couple, like 1 or 2 states that don’t have any of these protections and they fall back to the federal laws. But then there are also the states that go beyond those laws such as the wage transparency that I think we brought that up in the webinar too. Basically, you can’t prohibit your employees from discussing their wages and you can’t retaliate against them if they do. There’s other states that have set up hotlines for employees to be able to call into if they want to report pay discrimination. There are other states that we’re seeing that actually are narrowing the meaning of equal pay for equal work, so as a federal law it’s pretty general and I think Jaime touched on this as well. It’s so broad that you can use almost any reason other than gender as your reason for pay discrepancy but all of the states are actually narrowing what that means, so basically it’s allowing for more lawsuits to be brought by lowering those restrictions. I think those are the main ones that you’re seeing where basically they’re just limiting what they can enforce and actually say and for the reason the justification for paying men and women differently, and some of them are actually limiting what the defenses are like I said as well, so that’s just allowing for more lawsuits basically. But if your state doesn’t have these laws, like we said, please always follow the federal laws. They’re kind of decreasing the loop hole that employers really have when it comes to hiring, which is to be able to position them to be able to find a way to discriminate that salary paid between men and women and that’s obviously a good thing too. Where could you find out if your state, county, city has banned the box? 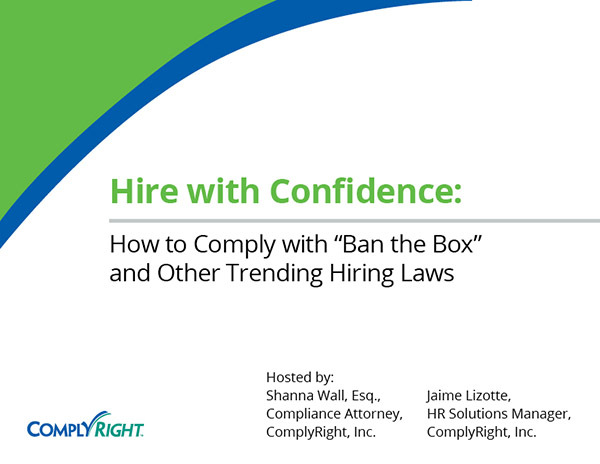 This is actually a great question and I’m glad that somebody asked it because I know I did a poll yesterday and during the poll we asked if the attendees on the webinar were fully informed about ban the box requirements affecting their hiring locations and it was an overwhelming abundance of people that said they were not sure. A great place to start looking at is nelp.org and I mentioned NELP during the webinar yesterday. NELP is the National Employment Law Project and they have a lot of information regarding the international campaign of ban the box so it’s a great place to start. They have a great map that can show you some of the states that have banned the box and have different enactments or limited questions, however, it is always best to consult a labor law attorney when you do have questions regarding business laws and compliance. That way you can be sure that the information is accurate and you’re obviously meeting all compliance laws and regulations for your business. Does delaying a background check to later in the hiring process increase the employer’s exposure to discrimination claims? No, I would actually say it’s the opposite. I think that’s kind of the point of delaying your background checks until later in your hiring process. The reason for that would be if you did ask a criminal question right up front on the job application then there’s a high likelihood that you’re just going to discard all those applicants that check yes to your question and that’s what’s going to increase your exposure to discrimination lawsuits. If you do decide later to continue on with that applicant and you do an individual assessment like we discussed as well, then you’re actually lowering your exposure because now you’re going to be able to see what the qualifications are of that candidate. And when you run your background check later, you’re going to be able to see if the criminal history is in fact related to any kind of business needs that you have. Then you would be able to make an individual assessment and give your applicant a chance to explain what happened or fix any errors that might show up on the background check as well. I think the answer is quite the opposite: it’s going to actually decrease some of the weight. Any thoughts on if we will not be able to ask what a candidate’s current salary rate is? If we’re not able to ask what a candidate’s starting or ending salary is on their application because their state has a pay equity law, like Massachusetts for example, that will start on January 1, 2018. Well, salary history is something that employers are used to asking or knowing before they go into an interview; however, if your state adapts to pay equity and you’re not able to ask what the starting or ending salary is, there is a question that you can still ask. You definitely can ask desired salary on a job application as well as in an interview. This is a good way to get that information; however, if you do ask this question, it is highly recommended that you want to make sure that you ask all of your applicants the same question to make sure that you keep the hiring process consistent and fair. Asking the question of desired salary would be the way to go around not being able to ask the current salary and yes, you can ask it, but just make sure you ask it to all of your applicants. If you ask applicants their citizenship status and depending on their answer, for instance, if they selected an alien residence, can you limit those candidates for being considered for the position? I’m not 100% sure if this question is asking about the job or in the interview but then again I don’t know that it really matters. What you want to ask is more along the lines of are you legally eligible to work in the United States and you kind of just want to leave it at that. We do just want to leave it at that because if you start asking specific questions then you could get yourself in trouble with things like your national origin and discrimination. You don’t want to systematically just eliminate candidates based on one thing such as their citizenship, disability, or criminal history and that’s why in the interviews I know we discussed that as well, that you want to keep your questions very neutral and you don’t want them to lead to an answer where they’re telling you about a protected class they may have membership in. So this would definitely be one of the things especially if you’re, like you just said, if you’re asking if you’re a resident alien and you’re just automatically eliminating those, then you’re definitely setting yourself up for national origin discrimination or any other kind of protected class discrimination but specifically that would be a national origin kind of issue I think. When you do get the slides there is the slide we went over yesterday: the off limit questions, so make sure you continue to look at that and even print it out and keep it by you when you’re getting ready to go into an interview so you know what your off limit questions are, so you don’t get yourself in hot water because you may not be wording it the same way but like Shanna said, if you’re asking the questions that are going to allow the applicant to answer it and provide a protected class, then you’re going to get yourself in some hot water, so you want to be careful. What if the criminal history discovered is a crime or crimes that make the hiring managers or HR uncomfortable such as a restraining order or some active violence: is it ok to reject the applicant based on safety concerns instead of a job requirement, no matter how the applicant tries to explain the situation? This is actually one of those questions that stood out for me while we were doing the webinar and I think this is a really great and important question. I know that we were talking about individual assessments and were talking about making sure that its job related that there’s a business necessity, a legitimate business reason, for excluding candidates based on their criminal history. Here’s a good example of that: specifically when you’re hiring somebody you want to make sure you’re picking the best candidates, and like we said in the webinar, just because you might be blocked from asking criminal history at the beginning or even until after a conditional offer is made, it still doesn’t require you to hire someone with a criminal history. That’s not what this is about. This is about getting to the point where you find out who is the best candidate. If you have safety concerns then that is a legitimate business reason. As a matter of fact, under OSHA, you’re actually required to provide a safe work environment for your employees, so if you hired someone that you have serious reservations about (safety concerns) then this would be another good example of negligent hiring if this candidate somehow goes off the rail and starts injuring, threatening, or destructing the workplace in any way. That is actually a legitimate business reason. It doesn’t necessarily always have to do with their job position. Maybe this person works alone, so you think okay, he had an assault and this person is working alone, then if that’s not job related, but this person is still going to be working in an office with you and coworkers so everybody has to be able to work together, and that’s part of finding out who your best candidate is. You’re also going to want to notice the temperament of this person, the personality of this person, and that can go back to some of the pre-employment testing. You can test for their skills but you can also test personalities as long as your state or city allows that. This goes back to again just finding your best candidate and taking an individual assessment. If this person tries to explain the assault, but you still don’t feel comfortable about it, that’s still a legitimate business reason. Like you mentioned, it’s always going back to checking your state/city/local laws that can be different. We mentioned this multiple times throughout the webinar and I’m sure you’ve heard it before on other webinars. It’s something that we always make sure to say so you make sure that you are covered across the board, not just federally.